Khair. They can’t all be Teesri Manzil or Junglee, can they now? Our story begins in Singapore, where a man named Ramesh (Gautam Mukherjee) manages a rubber plantation belonging to his childhood friend Shyam (Shammi Kapoor). Ramesh is in a relationship with Shobha (Shashikala), the daughter of wealthy New India Club owner Shivdas (KN Singh). She is delighted when Ramesh tells her that he has decided not to sell Shyam’s rubber estates and return to India as previously planned because he has discovered a clue to some “treasure” on the property. He has sent three letters about it to Shyam and received no reply; but other people are certainly paying attention! Shivdas and two of his henchmen, Chang (Madan Puri in faux Chinese mode) and Kapoor (Rajan Kapoor), have planted a listening device on the lamp at Rajesh and Shobha’s table. Luckily (or unluckily, depending on your point of view) Ramesh is not confiding in Shobha any more than that. After taking her home Ramesh returns to his office, where he telephones Shyam in India and finally reaches him. He tells Shyam that he’s found a map which shows that a treasure is located on Shyam’s property. This is a stellar gadget scene: a reel-to-reel recorder automatically tapes the call, and Ramesh stashes the map inside a musical cigarette case masquerading as a bottle of VAT 69 when his conversation is interrupted by two men lurking outside. Shyam hears the tinkling of the musical case as Ramesh shuts it quickly into a desk drawer. I simply adore the explosion of cigarettes when the thing is opened, and the completely incongruous tinkling ballerina music which issues forth. Ramesh is kidnapped when he goes out to investigate the intruders. A confused Shyam is left talking to nobody, and when Ramesh subsequently fails to show up for work, he decides to go to Singapore to investigate. On the plane to Singapore, Shyam meets the mysterious Maria (Maria Menado) who flirts with him. He is greeted at the airport by office manager Cha Choo (Agha, and oh how these fake Chinese names both pain and amuse me!). Cha Choo is of course the CSP and he is in love with the receptionist (Lillian) who is herself predictably named and whose Hindi is almost as bad as mine. And also, the office peon is named Lo Mein. Not kidding. Some suspension of disbelief is required here, since everybody in Singapore appears conversant in Shyam’s mother tongue, even the police. The police are actually fairly competent in this movie, maybe because nobody wanted to offend Singaporeans. Shyam files a missing person report with them; on the way back to the office Cha Choo remembers that Ramesh had a girlfriend who danced at the New India Club belonging to her father. That evening Shobha is not performing, but her older cousin Lata (Padmini) dances in her stead. I resolve to immediately begin pencilling winged eyebrows onto MY face. When Shyam introduces himself to her afterwards, thinking she is Shobha, she invites him to come home with her. There the confusion over identity is resolved and Shobha tells Shyam that she too is worried about Ramesh as it’s not like him to go off without telling her. Shyam also sees a woman leaving the house who looks very like his secretary Miss Chin Chin Choo, but Shivdas now appears and distracts his attention. Lata introduces them and Shivdas tries to deflect concern over Ramesh’s disappearance. When Shyam takes his leave, Lata shyly asks him to come again and he promises he will. Miss Chin Chin Choo denies having been at Shivdas’ the night before when Shyam questions her in the office; and he gets a call from another pretty lady—the woman he’d met on the plane. She invites him home after a garden song-romp, and arranges for him to be shot at through a window. It seems she, too, has an interest in Shyam’s rubber plantation and wants to scare him into selling. Shyam finally finds the map Ramesh had hidden in my the VAT 69 Musical Cigarette Case after listening to the recording of their call. I should mention here that the editing in this—probably at the vcd/dvd manufacturing phase—is awful. Scenes begin abruptly with people who weren’t around a minute ago, and the cuts between scenes are choppy at best. 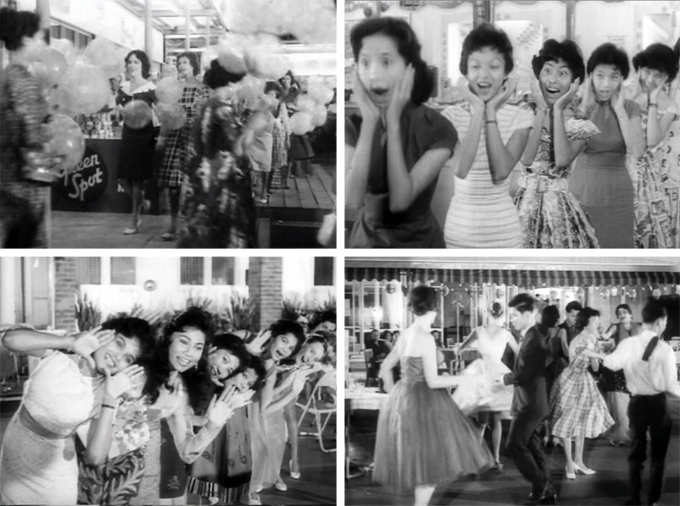 Anyway, Shyam’s romancing of Lata proceeds apace, buoyed up by streets full of women of all nationalities wearing shirtwaist dresses and cheongsams, waving balloons and making faces and dancing the cha-cha-cha. It’s so cute it makes my teeth ache. Shyam sets a trap for the gang holding his friend Ramesh captive: he plants a story in the local newspaper about finding the map and creates a fake one, hiding the real one back in my the V69MCC. It’s not long before his bait is taken. Shivdas invites him to picnic with Shobha and Lata, and steals the map from Shyam’s car as a hidden Shobha looks on in dismay. She follows her father as he goes to meet his henchmen, and they capture her as Shivdas is shot. Hearing the shot, Shyam rushes to the scene and Shivdas gasps out a request for water. When Shyam returns with the water Shivdas is gone, only to show up later in Shyam’s bathroom—dead. Lata is stricken both by her father’s death and her cousin’s disappearance and she is quick to believe the police when they arrest Shyam for the murder. Who is the mastermind behind all of this? Where is Shobha? Is Ramesh still alive? Can heartbroken Shyam win back Lata’s love and trust? Who will find the real map and the treasure first? I think my main issue with this film is the pacing. The story gets bogged down in details and unnecessary dialogues and tangents, even with the indiscriminate chopping inflicted on it. It also lacks any real mystery or suspense: we know from the get-go who the bad guys (and gal) are and what they are after. I don’t not recommend it by any means, but I get bored at about an hour in. Since this is set in Singapore-East Asia, there are rules to follow. But mostly, of course, the reason to watch this is Shammi. Shammi Shammi Shammi!!!! Posted on June 23, 2011 at 3:56 pm in Hindi movies, Yahoo! Shammi! | RSS feed You can skip to the end and leave a reply. Ramesh is Gautam Mukherjee. Trust me! I think you may be right, but I need PROOF…maybe the “gora” guy is Vinod Sharma. There just aren’t that many names in the credits of Yakeen which might suit that large a role. Padmini looks gorgeous in this, and is a wonderful dancer. The songs and her dancing are pretty much the reason to watch this if you aren’t a Shammi fanatic like me. I did like it the first time I saw the whole thing, but I initially bought the Sky DVD which stopped playing about 30 minutes in. When Shameroo finally put its version out I was just so happy to be able to finish the damn thing and see what happened! The beginning is pretty good; but it just gets really bogged down in the middle and never really recovers and repeat watching just makes that worse. I have seen this, but too long back to remember much more than that it did get distinctly tedious for me – which is saying a lot for a Shammi Kapoor movie! What amused me was that a lot of the stuff in this film is either recycled or got recycled later. For instance: ‘Miss Chin Chin Choo’ is obviously a nod to Helen’s brief but awesome role in Howrah Bridge; that cigarette case with the ‘exploding cigarettes’ is something I have seen in a later – colour – film, though right now I can’t remember which one. And Shammi Kapoor – in a number of screen shots from the post is wearing the T-shirt (that light-coloured one with the collar and dark shallow V-design) which he wore in the climax of Professor. I’m all for recycling, especially the exploding VAT 69 cigarette case. And Shammi can wear whatever he wants! :) But yes…tedious is the perfect word for it after a while. – Shammi of course’, though his chemistry (?) with Padmini could not have helped the movie. – Maria Menado. I found her properly ruthless – and that’s the type of villainess I like. No senti stuff. – A few songs. “Dhoka khayegi” is nice and catchy. The title song is good too. Other than the above, not much else. I guess this movie was just an average grosser? I have watched Raat Ke Rahin but without subtitles I just got confused and my head ached. And the picture was pretty abysmal (although better than nothing!!!). If the universe ever gives me a nice video with subtitles I will be all over it like white on rice! I subtitled a couple of songs for Tom from this movie, and wow.. Shammi looked gorgeous in them. So young, so slim, so dashing. Hat jao diwane aaye and Tu kahan kho gaya balam matwara were lovely songs. I like the songs (except the title song, which I find irritating) and Shammi is really at the height of his beauty in this one :) That’s what got me through it! I thought, oh god, why didnt you keep shammi looking like this FOREVER. So the consensus is that i shd not be trying to find this movie as so many people have not found it interesting – some even abandoning it after some time. How did you manage to get access to this movie memsaab? I have Howrah Bridge, Mr & Mrs 55, Sahib Bibi aur Ghulam, Solva Saal etc in my To Watch pile. I guess I have to make a toss between watching a recent flick, a colour oldie or a B&W oldie tonight! At the moment I am inclined towards madubala and bharart bhushan in Barsat ki raat or baat ek raat ki? This is pretty easy to find I think, mine is a Shameroo dvd. I wouldn’t say don’t watch it, but certainly there are more entertaining films out there. I love the nightclub scenes :) New India Club zindabad. Tom mentioned that to me as well when I told him I was writing this one up (it’s been about four months in the making)…and see above for why I said I liked it then :) I still like it, actually, but not enough to watch it over and over again. The FF button is my friend! RE: Raat ke Rahi, I’m not sure sub-titles would have helped, the movie is messed up in other ways (reels out of order? ), though the concept, casting and music are all indeed great. I didn’t even realize the reels were out of order, that’s how confused I was :D But yes, Shammi almost always makes everything worth sitting through at least once. Except Jeevan Jyoti. Ohhh Singapore!!!! With what pleasure I started watching this. How could a Shammi film not be wonderful. But – only Shammi was wonderful here (and of course Padmini *adds quickly* ;-))!! Even though he wasn’t his usual energetic self just watching him was compensation enough, for some time. I’ve watched it about five times now, and that may be it for me :) But Shammi is just fabulous, at his peak. So…you never know. We picked up a video of this one once upon a long ago and put it back, a pity, since that store shut down afterwards. Par kuchh bhi kaho, moochhmunda Shammi Kapoor hai na! Ek baar dekhna padega. I’d liked whatever I read about the plot on the jacket. In that second screencap, the resemblance between him and his nephew is so evident, but of course, no one compares to the one and only Shammi Kapoor. As for SKY Entertainment, it should be grounded – it’s the reason I don’t know whodunit in Bhoot Bangla and how Ujala ended. Whenever we see the ominous SKY Entertainment logo on any DVD, we see visions of yet another half-watched movie and recoil in fear. Now I know I have options – like send you a polite request for the ending, but will continue to shy from SKY. Is Ratan Gaurang still around?Any info? If Ramesh is the one who is with Shashikala above then yes he is definitely Gautam Mukherji. By the way Shammi and Padmini together well I do not think I would like watching this pair, Shammi with Sharmila, Sadhana why even Shakila yes but this pair…… not too sure. If anyone would know, it’s you Shilpi—thanks for confirming! Shammi and Padmini aren’t that great a combo, but the romance is sort of a sideline anyway. “Edwina has a short scene and dialogue with Shammi as well. (I am Not Jealous. )”-You should not be, as if you were in her place, the dialogue would have been just three words, and that would have been the end of the film, there would have been only one lead actress in all subsequent Shammi films, and maybe no memsaabstory.com thereafter; only the performances of a hot and ravishing firaang chick with an unknown name recorded in cinema reels, to give us cold comfort. I agree with Richard and Shilpi that Padmini looked better RK, but who is/was her younger sister? Want to know. Helen should have been cast as the lead. This would have resulted in better viewer response to the movie. Shammi’s makeup resembles that of magician Saamri in DDD. TG, you are funny :) If only! @ TG, I just saw your comment a day later (thanks to the WordPress “My Comment” follow-up feature :) )… Padmini’s younger sister was Ragini. Thanks Richard. Would look up her background in Bolly archives. From this movie, I loved the “Tum laakh chhupana chahoge par pyar chhupa na paoge” song. I actually had to go back and watch it again. @Memsaab, this movie does not seem to have some of the items from the Shammi Kappor film checklist, so probably does not rank up there along with the others. Is there anything you would want to add? Hey :) I stumbled upon your blog while goggling one of Shammi’s movies, Dil tera diwana! To be really honest i couldnt find one decent review or any site giving atleast a synopsis either and then i stumbled across your blog! Indeed girl….you mirror my own thoughts. It was purely accidental, I was just listening to Ehsaan tera hoga mujpar from Junglee, a song i used to hear my dad hum ages ago……. I dont know what took over me and i just thought of giving the movie a try. And the rest they say is history!!! I have been *rather obsessively* watching Shammi’s movies ever since and damn i dont want that day to come when there wont be any more to see. Rafi Saahabs melodious voice and Shammi’s charms have got me dangerously addicted! For now well, dil tera diwana it is for tonight, thanks a ton! Pleasure reading your blog! Hmmm, so Padmini did act in a Hindi movie before Kajal (1965). I was not sure why there was an ‘Introducing’ before her name in this. Your review answer my question, Greta. Her other two sisters Lalitha and Ragini too were brilliant dancers. Shammi, what to say of him? From the moment I started reading your blogs, I have seen him in a new light whenever I happened to watch his movies. Not that I disliked him earlier, but yes, he does have that magnetic personality. But my favourite star will always remain Dharmendra :-) He’s just so unbeatable in everything – looks, acting, fights, etc., Maybe in dancing he could be behind Shammi. I haven’t seen ‘Singapore’. I haven’t developed a fondness for Padmini yet, remember her only in ‘Mera Naam Joker’ and a couple of other films. But you may convert me yet. Songs from this movie air constantly on 9X channel which has a delightful 1 hour songfest from the 50s/60s and another 1 hour of songs from 70s/80s everyday. The program is called Phir Se. I watch it often hoping they’ll air different songs but they seem to love repeats. Singapore doesn’t really have a repeatable score but somehow its songs feature constantly on the show which annoys me greatly. Nice review but since i’ve heard the songs so many times and dont see much chemistry between Padmini and Shammi, I’ve made up my mind not to watch the movie. Shammi and Vyjantimala were so much better in Prince and apparently there’s one more movie with the two (Tangewala? Tangewali? Something like that) which I’d love to see if I get a chance. RIP Shammi kapoor, you brought us joy. Memsaab, You gave a kinda left handed compliment to the film, but I was pleasantly surprised that it was a good wholesome entertainer, the experience was fully enhanced by the radiating beauty of Padmini, the dancing diva of 60s, specifically in the club dance :”aane laga”. She was a South India classic beauty contrary to the plastic/ cosmetic beauties of nowadays. Even Shammi Kapoor was not his usual “hyper” self but mostly quiet and sober ( for a change)..The story was neat and handled well by Shakti samanta too..
Shammi of course is the clarion call. Singapore was a pleasant experience with excellent songs which are remembered even today and also their picturisation.